يقع Macdonnell Range Holiday Park على بعد 5 دقائق بالسيارة من ينابيع أليس، وتحيط به سلسلة جبال ماكدونيل الجميلة. يمكن للضيوف الدخول إلى مسبحين ومسبح للأطفال. تحتوي جميع الغرف في Macdonnell Range Holiday Park على تدفئة/تكييف وشرفة أرضية مع أثاث في الهواء الطلق. كما تتوفر مرافق كي الملابس ومرافق الطبخ الأساسية. توفر غرفة الترفيه طاولات البلياردو وتنس الطاولة وألعاب الفيديو. يمكن للأطفال الاستمتاع بملعب المغامرات وملعب كرة السلة بنصف السلة. وتتوفر خدمة تأجير الدراجات. وتتوفر غسالات ومجففات ملابس في غرفة غسيل الضيوف. كما تتوفر مرافق الشواء. يقع Macdonnell Range Holiday Park على بعد 15 دقيقة بالسيارة من مطار أليس سبرينغز. يرجى إبلاغ BIG4 MacDonnell Range Holiday Park بشكل مسبق بوقت وصولك المتوقع. بإمكانك استخدام حقل الطلبات الخاصة أثناء عملية الحجز أو يمكنك التواصل مع مكان الإقامة مباشرةًً من خلال معلومات التواصل المذكورة في تأكيد الحجز. good, feed wallabies was fantastic. The Heavy Tree Gap Outback Lodge turned out to be the best value for money when we needed a room while doing some renovations to our house in Alice. The room was adequate and had all the facilities needed. However, it had a strange smell to it (maybe from previous smoking? ), but the worst was that the hotel expects you to wash your own dishes in the bathroom sink. We left our dishes standing on the bathroom floor for 3 nights and the room service worked its way around them.....very strange. It's nice to watch the rock wallabies coming down to the car park at night. Helpful staff when arrival was delayed; excellent location; great value for money. This is a great old-fashioned motel and camp ground for adventurous tourists who want an unpretentious experience in a wonderful setting. The staff are a great example of why Aussie tourism is so good. The kids were happy to feed and touch the wallabies... no other good point. Was probably the worst hotel in my holiday: very dirty and smelly room, many spots on the carpet and dirty cutlery in the kitchenette. I know that is the center of Australia and animals are everywhere, but the huge cockroaches that came out of the shower caused a sleepless night for my kids. Air conditioning system was noisy and not really efficient. Good swimming pool, fast wifi, lot of parking space. The food for the wallabies supplied by the reception desk (1$) made the day for my kids: was good to see them happy feeding and cuddling the animals there. But still, it's a place I don't want to return. Awful experience all together! The room & toilet/ bathroom were dirty/ filthy like anything & never got cleaned even after complaining. The bed linens were disgusting & even had hair all over it with other people's body odour! I complained to the reception & they promised to clean it but that never happened. When hotel management didn't take care of my complain, I decided to talk directly to the cleaner who mentioned that they were 'overworked' so couldn't help it! The freezer of the fridge wasn't working & the door was broken. And last but not least, they stopped the water supply all of a sudden without giving any prior notice for 10 min. On our second last day of stay, I was at shower & had soap all over me including eyes & there was no water!! I couldn't even come out or open my eyes...told my son to call the reception & tell them the situation. The reception told him "Sorry have to wait for at least ten minutes as maintenance is on!" It's a JOKE!! I had to stand & wait in the shower at that freezing cold weather with my wet body with soap all over it for more than 10 minutes! It happened couple of times before as well during our stay in total of two weeks. There was NO WARNING what so ever neither any apology! Quick in and out enroute further north. Easy to book on line. Cheaper than competition in town. hotel is ina great location. nestled against the cliff face and above the todd river, the evening light is beautiful wallabies abound adding to the experience. convenient to the airport and to the town. It is a quiet location and has all the amenities needed. The wallabies are a added attraction to the visit. Hotel was acceptable and certainly good value for the amount of money you have to pay! The place is a little out of way and you need to catch a taxi to get into town (approx. $20) Also, the blankets were really tough and thin and generally cheap. But again, you're paying so little for the night, you could easily overlook its faults. heavitree gap is an unusual place. it is sort of rustic but a good match for its setting. there is a great pool, tavern/casino and the best thing of all...the daily feeding program for the colony of rock wallabies just behind the hotel. you could buy a bag of feed for $1aud and beginning about 4:30 in the afternoon, they come down from the mountain to eat. they are quite tame, and i was actually able to feed one of them by hand. it grasped the sides of my hand with its tiny black paws and munched away, much to the delight of other guests, who captured the moment with their cameras. 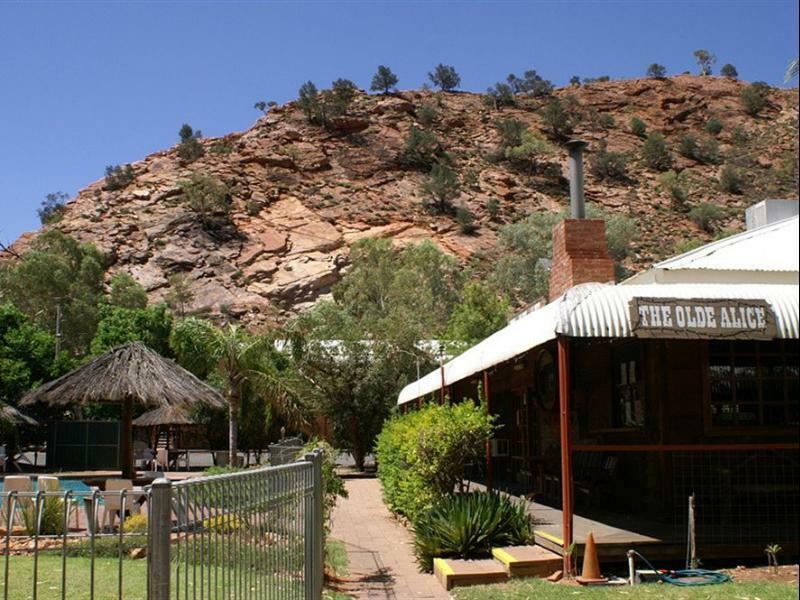 if you are staying in alice springs, most definitely book the heavitree...very reasonble rates and an experience you won't forget. this was a great resort to stay at, a nice warm pool, large, comfortable room, well equipped, feeding the wild wallabies at night was a bonus. the only gripe i had was the free shuttle, it would drop you off downtown but not necessarily come and pick you up if you didn't reserve it to do so. we got stranded downtown one evening because of that. Good location but rm size a bit small for family. Close to airport n not far fr city centre. A nice place to stay !! Rm size is a little bit for family. Not too far to City centre n close to airport. Recommand ppl to stay there ~~ I'm happy with the hotel.